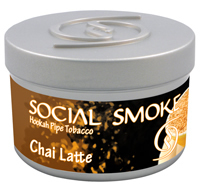 Social Smoke Chai Latte | HookahRev.com | Hookah, Simplified. What a great dark flavor of spiced tea. Not as much burnt rubber taste as regular Social Smoke. Watch out for heat as usual with Social Smoke.